Kokonut Pacific Solomon Islands (KPSI) is a producer of top grade coconut oil and part of this year’s Pacific Islands Trade & Invest (PT&I) Pacific Path to Market delegation to Auckland’s Pasifika festival on March 25-26. PT&I’s Pacific Path to Market adopts a structured approach to helping exporters investigate new markets for their products. Pasifika is the 3rd stage of the PT&I Pacific Path to Market programme giving businesses an introduction to the New Zealand market. KPSI will showcase its star product – Organic certified, Virgin Coconut Oil (VCO) and 100% coconut oil soaps. The company has more than 50 producers on its books, across a wide network in the Solomon Islands. The good news is more than 60% of the oil revenue goes back to the villages providing an income for over 5000 people. In 2016, KPSI won a raft of awards including the Prime Minister’s Business of the Year Award, the Business Contribution to the Community and Exporter of the Year. KPSI was established by Australian Dr Dan Etherington in 1994 to improve the well-being of the rural populations of tropical islands through the production of premium grade coconut oil and other coconut products. Dr Etherington learned the process on a remote island of Tuvalu from the people who had discovered how to cold press coconut oil from sun-dried coconut. He went on to create the Direct Micro Expelling (DME) method of processing coconuts into coconut oil using a cold press. One of the beauties of the DME method is that producers can turn coconuts into oil within an hour of opening. Direct – quick (oil can be produced in 1 hour of opening the nut) and efficiently expels 85% of the available oil. Micro – it can be done in small scales on family sized farms. Expelling – the extraction of virgin coconut oil and meal. The objective was to revitalize the small holder coconut industries through using modern technology and partnering with local communities, local firms, non-government organisations and Governments to ensure the right support systems are in place. 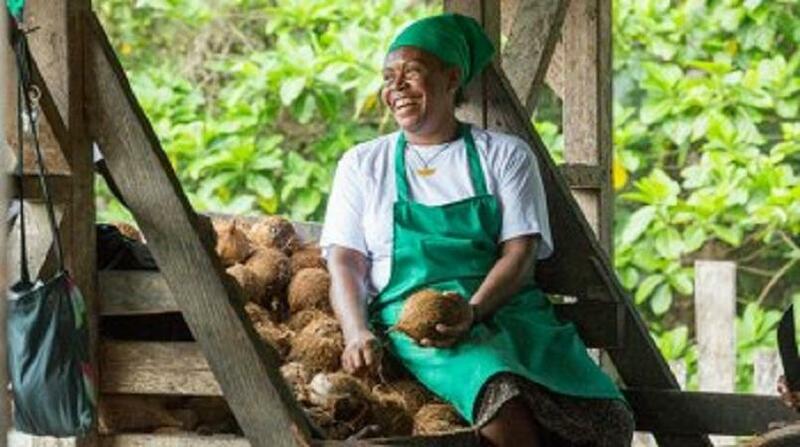 The introduction of DME processing changed lives through a 5-fold increase in the value of coconut exports compared to copra (ref: kokonutpacific.com.au).